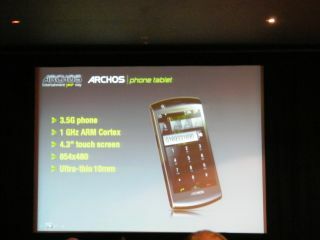 At the launch event for the Archos 5 Internet Tablet, the French PMP manufacturer teased the press with another device - Archos' first phone. Though most were expecting the first Android device (The 5 Internet Tablet) to fill this category, it sadly comes without a cellular connection. The new phone, which was only shown in two slides without any more information, features a 1GHz ARM Cortex processor, making it the most powerful mobile on the market. It will also pack a 3.5G connection, 4.3-inch touchscreen and a slightly unorthodox 854 x 480 screen. Archos is calling it 'ultra thin' as well as it comes in at only 1cm, although we'll have to see it in the flesh first to decide. Word has it we'll be seeing the first versions of the phone at CES this year, so we'll keep our eyes peeled when we head to Vegas for the 2010 event.